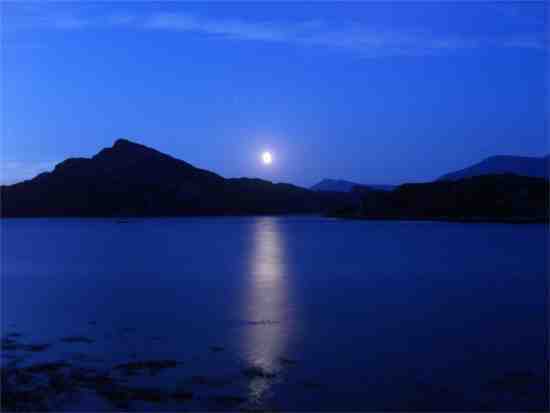 This picture is courtesy of Murty Campbell and Stornoway Canoe Club. If you are looking for a low feature such as a beach or a small navigation buoy, it may be on the other side of your personal horizon. The eyes of a seated kayaker are only 30 inches or so above the water so his / her horizon is less than 2 nautical miles away. Except when the kayak is boosted higher by a wave. Inuit hunters looking for seal or narwhal would raft up in an X, so that one of them could stand up to see further. If you are hoping to catch sight of a navigation buoy three or four miles away, you will need both luck and good eyes. 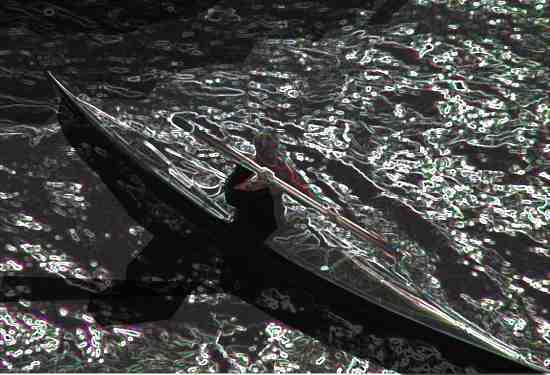 If you are looking for another kayaker who is three miles away you may see the top blade of his paddle flick-flick-flicking every time he takes a stroke but you will see only the occasional glimpse of his head. Committed Flat-Earthers should try standing on a beach on a clear day and looking at a ship in the distance. 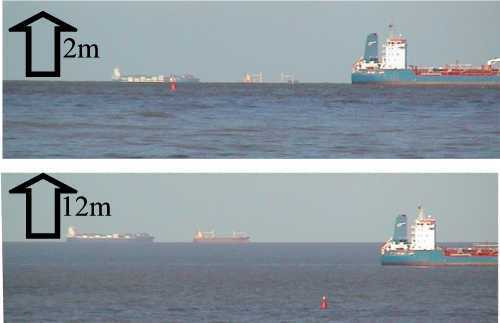 These are real photos of the Straits of Dover, the world's busiest shipping lane, taken from shore, a few minutes apart on a clear day using a 12x optical zoom. For the top photo I was standing on the beach with the camera about two metres (6 feet 6 in) above sea level. The container ship on the left looks odd because most of its hull is concealed by the horizon. To take the bottom photo I went 12 metres (40 feet) up the cliff behind the beach. Now you can see the entire container ship, and those strange vertical spikes near it turn out to be the masts of a red ship a few miles further away, the hull and superstructure of which were invisible when you were standing on the beach. The red ship was hull down. The presence of shallow water is revealed by the pattern of waves on the surface, and sometimes by water discolored by sand and mud churned up from the bottom. While you are still too far away to see details, the general appearance of the water will often be darker or lighter than surrounding deep water; and the brilliant white of occasional waves breaking in shallow water, or breaking there more frequently and regularly than in nearby deep water. Shallow water is seldom a problem for a kayak. It may be the best place to avoid ships or powerboats, it may provide a convenient short-cut, and it is sometimes the best place to be when the tide is flowing against you. It is useful to know where it is because it determines the speed and direction of tidal currents. Sometimes it helps you pinpoint your position on the chart. Hold your paddle by the end with one hand and thrust it straight down. That will at least tell you whether the water is more or less than 6 feet deep. If you think the depth is less than 12 feet and you are at a location which is exposed to a heavy swell, consider getting into deeper water before a big breaking wave hits you. ...the great glittering wheel of the night dripping with the heavy water of time was turned over remorselessly towards day. There's nothing quite like being in a kayak late on a summer evening, halfway between islands. You rest on a calm sea as the sun approaches the horizon. You know if you don't hurry it will be dark before you get back but you can't break the spell. Sea birds are heading back to their nests, a couple of porpoises breathe out in the distance, and three deer watch the sunset from a headland, tinted almost orange by the last rays. The sun dips below the horizon, the temperature starts to drop and you know you've already waited too long. Two hours later it's full night but there's enough moonlight to keep going. (On a moonless night with a layer of cloud you may just as well have your eyes shut, unless you have a flashlight or are within four miles of a city so that the orange color of highway lighting is reflected down from the cloudbase). If you're crossing open water with no landmarks, every 15 minutes you use your compass and pick a convenient star to aim for. Your heightened sense of hearing picks up distant breakers, the dip of paddles, the rush of invisible wings and sudden mysterious splashes. The stars are bright and steady above, and in your wake phosphorescence burns like cold fire in the clear water. The island is black on black as it passes to your left, just a shadow against the stars. You avoid looking at the lighthouse on the mainland because it's bad for your night vision. There's another lighthouse on a distant island. It's over the horizon but you can see the "loom" of its light every thirty seconds. You are half-convinced that you must have gone past your destination several minutes ago. Or could that be it? Does this dark little inlet lead to your destination, or is it the next one? There's nothing wrong with getting a bit lost. The journeys you remember are the epics, the ones where you needed all your senses and experience to get out of trouble. As always, you can do formal navigation before you set off. Keep a constant check on your location by timing your progress and occasionally taking bearings on recognizable things such as fixed navigation lights. See Night Navigation Marks. If you can identify a navigation light, you can use a compass to find its bearing from you and therefore your own location. Draw a line on the chart extract you carry on your deck, starting at the navigation light and extending on the reciprocal of that bearing. You must be someplace on that line. If you can find another line intersecting with it, such as a bearing to another navigation light, plot that on your chart too and you must be near the intersection. 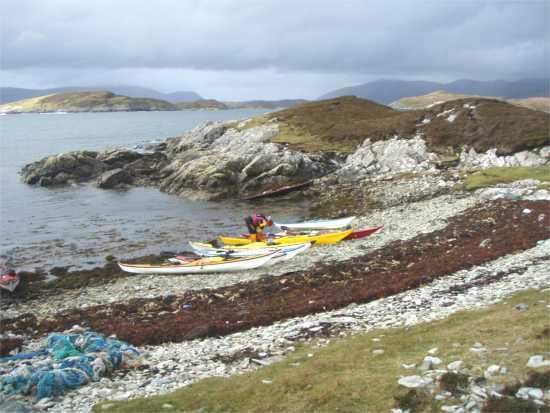 Usually a kayaker is near the coast, and the coast itself provides a convenient intersecting line. See Plotting Your Position. If you are looking for a small distant object at night, try looking ten degrees to the side of it rather than looking at it directly. Peripheral vision is better at night because your retina has two sorts of photoreceptor, cones and rods. Rods are better at sensing light and dark but there are none in the central part of the retina. It can take five minutes to acquire full night vision. Making brief use of a flashlight or even a brightly-lit wristwatch can blind you for several minutes, so if you're trying to identify the flash pattern of a particular navigation light, it's often better to count seconds than look at your watch. Your editor finds that he can accurately count up to twenty seconds by saying "1 Mediterranean 2 Mediterranean 3 Mediterranean 4" and so on; some prefer "1 New York City 2 New York City 3 New York City 4". The stars appear to rotate across the sky during the night. In the northern hemisphere the still point in the sky, the point around which the others appear to rotate, is the Pole Star. To find the Pole Star, look for the Big Dipper. Look at the two stars furthest from the handle and draw an imaginary line through them and up. That doesn't necessarily mean higher up in the sky, but up from the water if you think of a dipper. The Pole Star is the first bright star close to that line, about five times the distance between the two stars themselves. The only other candidate is Kochab, which is way off the line. If there is a chance you may be at sea on a really dark night, it is useful if your handheld compass has at least a luminous dot on the end of the needle; and if you have a deck compass with battery-powered illumination. On a moonless night, you can help your night vision by using only a dim light to read your chart extract, and putting a transparent red filter over the light. A small headlamp is ideal. Lamps which use light-emitting diodes (LED) rather than glowing bulbs give an unattractive cold light but have much longer battery life. If you wear a Cyalume glow stick on your back or helmet, your friends can see you without anybody losing their night vision. Alternatively you could use a very small flashing red LED. You can get a Cyalume from a fishing, diving or outdoor store and small waterproof LEDs from a pet supply store because they sell them for night-time dog walkers. Any boat at sea at night is legally required to display a bright white light so that it is not run down by other vessels. See the International Regulations for Preventing Collision at Sea (COLREGS), which are online in various places including wikipedia and the Admiralty Law Guide. Rule 25 says that a rowing boat, which would include a kayak, is not required to display the regular white lamp visible from all around as long as there is "ready at hand an electric torch or lighted lantern showing a white light which shall be exhibited in sufficient time to prevent collision". A few years ago, after the Dartmouth Regatta, some of the revelers were going home at midnight in their small inflatable boat, not displaying any lights because there was a bright full moon. They were run down by a powerboat. Everybody survived, but the helmsman of the inflatable was left barbecue-ready, with parallel propellor cuts up to 2 inches deep all the way up his back. He was off work for two years. Consider each carrying a powerful flashlight and wearing a reflective waistcoat. A flashing strobe light is a distress signal, not for collision avoidance except in emergencies.